Join the children in this delightful picture book, children who dream of skateboarding through the galaxy, of meeting a guitar-playing hippopotamus, of feeding a baby brother who eats EXPLOSIVELY! Find the knock-kneed knight! Travel to Saskatchewan "without your socks and sandals on"-and by the end of the book you'll be walking with an elephant and dancing with an elephant seal, able to speak "Tuque Talk" and sing a "Great Lake Rag" ! One of the poems asks: "How Big are You?" 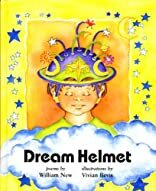 ("as small as a button, as big as a clue")-and whether you're big or little or in between, there's something adventurous and happy for you in Dream Helmet, a superb companion piece to Vanilla Gorilla and Llamas in the Laundry. 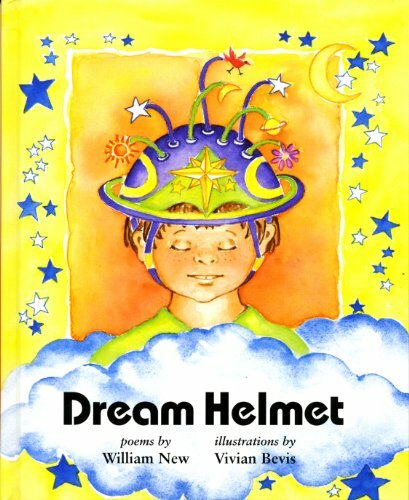 "From dreaming to streaming, from riding to sliding, Bill New's poems and Vivian Bevis's illustrations in Dream Helmet capture and celebrate the rhythms of childhood itself." About William New (Author) : William New is a published author of children's books. Some of the published credits of William New include Dream Helmet, Llamas in the Laundry, and Vanilla Gorilla. About Vivian Bevis (Illustrator) : Vivian Bevis is a published author and an illustrator of children's books. Some of the published credits of Vivian Bevis include Dream Helmet, Llamas in the Laundry, and Vanilla Gorilla.